Turns out Smith and K Vintners dropped the suit, without prejudice, in 2012. This means he could reopen it anytime if he chooses. If Smith ever found out who the anonymous commenters were, it's not reflected in the legal documents. A year and a half after he filed the suit, the defendants were still called "John Does 1-10." I don't know why Smith dropped the suit. Maybe he did find out who made the comments, and came to a settlement agreement. More likely he decided the suit made him look bad. Four years ago, when I got the subpoena notice from Google, I was frightened. I didn't want to be sued, nor did I want my readers to be sued. I didn't agree with the comments -- here's the original story with the comments intact -- but I didn't think they were libelous either. Let me state again for the record that I don't know who the commenters were and I don't want to know, so if you're reading this, don't tell me. Even if there was a "mutual non-disparagement agreement" with one of the commenters, suing him or her was a bad idea because it brought a lot more attention to comments that were several pages down on what was then a fairly obscure wine blog. As a consequence of the suit I stopped accepting anonymous comments. The comments section of my blog is less lively now, but I like it better, as most people who comment anonymously usually do so to write something mean, usually about the blogger. The other consequence of the suit is it put me on the wine blogging map. After writing about wine for a major newspaper, I left to take a job in the wine industry. When that didn't work out, I needed to re-establish my name as a writer. I was blogging, like so many people do, without much readership. I'm proud of the original post on Charles Smith. It's the kind of writing about wine I'd like to read more of, but magazines and newspapers won't buy something like it, something that's personal, reporting-based but opinionated, and not unreservedly positive. It's exactly what blogs can do that mainstream media can't. Going back to read it for this update, I think it's one of the finest things I've ever put on this blog. People read it, but not all that many. However, when Smith sued my readers, and I wrote a post about that, I got national attention, at least from the wine industry and the blog community. The publicity wasn't positive for Smith but doesn't appear to have hurt his business. It was definitely good for me. Maybe the wine world would have found my blog eventually, but Smith's lawsuit turned out to be a big break. I've only seen Smith once since this. I ran into him in the San Francisco airport. We shook hands and had a short exchange of pleasantries. He did not hit me hard enough to knock out my diaphragm; in fact, we didn't talk about blogging or lawsuits or anything at all. I didn't know he was planning to drop the suit, or I would have said something I can say now. Thank you for suing my readers, Charles. You were wrong to do so but it helped me a lot. And thank you even more for having the magnanimity, or at least the good sense, to drop the suit. What's the difference between using anonymous and not using last names. And any first name could be anybody, although that could also hold true for a fictious last name. There has been a difference. All I can say is that if the Hopsice du Rhone story is true, I hope that female employee lawyered up and went to town. Talk about free money. As for the man, I don't know him, but I've heard enough stories that there probably is some fire behind the smoke. As for the wines, mediocre, by-the-numbers ego juice with great--albeit cheesy--marketing. 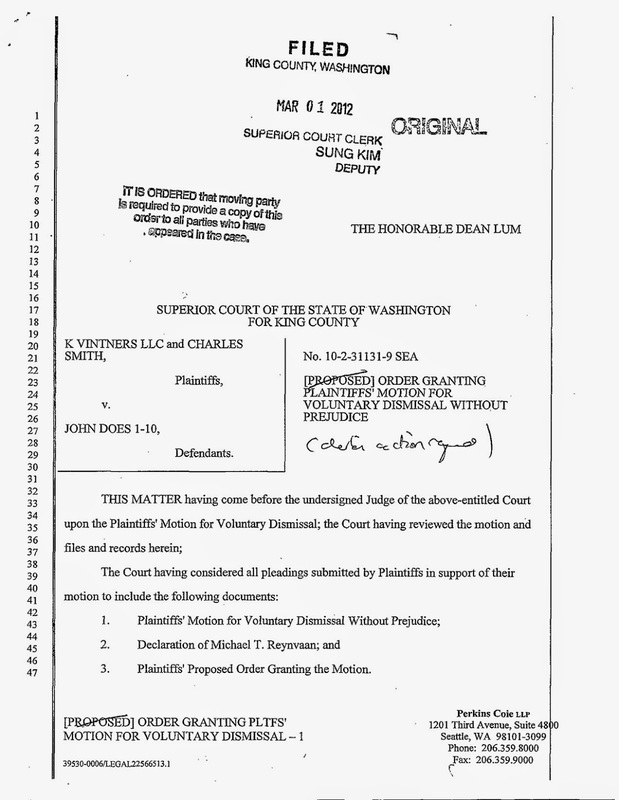 Why Smith would be wrong to sue persons who violated a written agreement? "Why Smith would be wrong to sue persons who violated a written agreement?" Not necessarily wrong, just ill-advised. But in the end nothing mattered, as he recently sold a good part of his business for a fortune.